TUCSON, AZ--(Marketwired - Jan 25, 2017) - ABCO Energy, Inc. (OTCQB: ABCED) announced the FINRA approval of the 1 for 10 reverse split of its common stock. The effective date of the action was January 13, 2017 and the company will trade under the symbol ABCED for 20 business days or until February 8, 2017. The reverse split has become necessary because of conversions of several promissory notes totaling $246,711 into 198,737,390 shares during the last half of 2016. The common shares outstanding at December 31, 2016 became 268,645,844 shares. The reverse was also necessary to allow the Company to raise capital from the sale of its common stock through the previously announced $5,000,000 financing with Blackbridge Capital, LLC. In addition, OTC Markets required a stock price in excess of $.01 per share in order to continue the Company's OTCQB listing. These were the cause and effect and the driving force for the reverse split decision. In addition to the reduction in shares outstanding, the company financial statement was improved by the elimination of $396,798 in direct and derivative liability and a reduction of related derivative interest and amortization expenses totaling $246,711 on the income statement. The total effect to the ABCO balance sheet for cancellation of the notes through conversion will be $643,509. This reduction in debt will improve the company credit lines and fund raising in the very near future. Due to the conversion of the debt to common shares, the company experienced a very large volume of trading and wide dispersion of it stock to many new investors and traders. Our post reversal of shares has resulted in approximately 26,871,761 shares being currently outstanding. This will benefit the Company in the future and will create a more reliable market for our stock. "In the first day of trading under the new symbol, our stock price reached $0.0235, which will allow the Company to proceed with the Blackbridge financing and begin to satisfy the OTC share price rules," says Charles O'Dowd, President of ABCO. "This will also allow us to issue new shares with less dilution on an expedited basis to raise capital necessary to expand our operations." 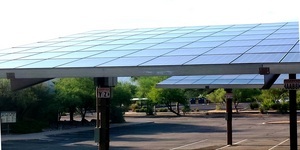 ABCO Energy, Inc. is an Arizona licensed contractor for sales and installation of Photovoltaic Solar Systems, Solar Street Lighting and installation of LED and energy conservation lighting systems in their markets. ABCO provides products and services to residential, commercial, government and non-profit entities in all their markets. About this company ABCO Energy, Inc.